Assistance League of San Jose members winners at Junior League of San Jose Volunteer Recognition Luncheon Gloria Cutshall, Judy Keniston, Sylvain Roberts and Rocki Kramer. 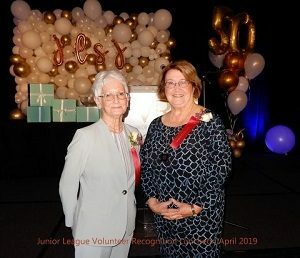 At its annual Volunteer Recognition Luncheon the Junior League of San Jose honored 80 deserving candidates. 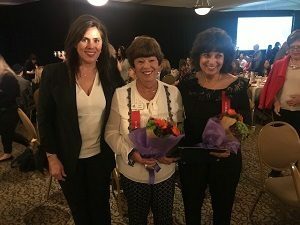 Two Assistance League of San Jose members, Sylvain Roberts and Judy Keniston were among those selected by the Junior League judges to receive one of ten Crystal Bowl Awards. They both received a Certificate of Appreciation and were invited on stage to be awarded a beautiful crystal bowl from Tiffany & Co. engraved with their names. Assistance League also received a $500 stipend in Sylvain and Judy’s honor. Two other chapter members were also honored at the luncheon. Rocki Kramer and Gloria Cutshall each received a Certificate of Appreciation for their outstanding volunteer services. 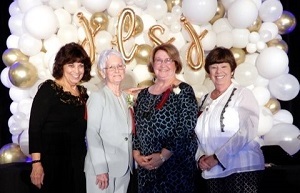 In all four Assistance League of San Jose members were recognized at the Luncheon this year. A video highlighting Sylvain and Judy was presented at the luncheon. The video featured the ladies performing some of their many tasks in the Operation School Program® that they chaired and the reason for their recognition. For the past six years they have ordered, unloaded, organized, categorized, packaged, measured and delivered or arranged delivery of the school uniforms to students in 39 schools in 3 different school districts within the first month and a half of the opening of the school year. Beforehand Sylvain and Judy visit schools, meet with school contacts, ascertain the color of uniforms worn at each school; some wear navy shirts with navy pants, some wear forest green shirts with khaki pants, etc. Finally the ladies get the 150 Assistance League of San Jose members divided into measuring teams of 5 or 7 depending on the number of students receiving uniforms at a particular school, it could be 155 or 110 students. The playing field for these youngsters is now equalized for they can concentrate on their studies and not on what they are wearing. With the right uniform they fit in. They are part of the student body. Because of the unselfish dedication of time, energy and commitment that these two wonderful and dynamic women put into Operation School Bell as this program is called, there are over 5000 students grades TK to 6th who are wearing school uniforms today. This past year it took over 10,000 school uniforms at a cost of over $100,000 to accomplish this feat. Sylvain Roberts and Judy Keniston definitely deserved to be honored. Their work is evident every day and every time that a youngster puts on his/her school uniform. 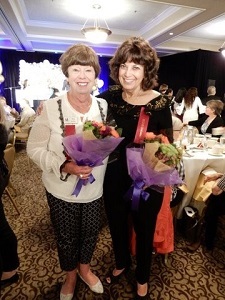 ALSJ members Rocki Kramer and Gloria Cutshall Junior League of San Jose Certificate of Recognition award winners. Ricki is the Resource Development chair and Gloria is the Philanthropic Programs chair. They were recognized for their work in these programs. San Jose City Council Member Magdalena Carrasco with Certificate of Recognition winners Rocki Kramer and Gloria Cutshall.